If you are a history buff, or simply love discovering the exotic, Hue (pronounced Hway), Vietnam’s former royal capital, ought to be at the top of your travel list. The city represents the outstanding demonstration of power that once belonged to the Vietnamese feudal empire. A crumbling complex of monuments, tombs and pagodas now blends with some of the best hotels in central Vietnam. Our pick of the best places to stay in Hue provide choice for all from top notch luxury to a more understated option away from the hustle and bustle. Four citadels comprised what was once the capital city of Vietnam. The Imperial Enclosure housed the emperor’s residence, temples, palaces and the main buildings of the state. Though only a fraction of the original remains standing it is well worth spending half a day wandering around – try to find some of the less-visited corners which are very atmospheric! The Thien Mu Pagoda is an icon of Vietnam. Built on a hilltop overlooking the Perfume River, each of its seven storeys is dedicated to a manushi-buddha (a Buddha that appeared in human form). It’s tough to avoid the tour groups here, so arrive early. Various royal tombs are scattered along the Perfume River, some more extravagant than others, though all undoubtedly impressive. Many of them can be reached by boat, though it is equally enjoyable to rent a bicycle and explore at your own pace. Hue cuisine is also worth a mention as it differs from that of the other regions of the country, and is simply delicious. Whether enjoying a humble bowl of bun bo hue (sweet and sour soup with rice noodles, beef and lemongrass), or the particularly unique com hen (rice with baby clams), we guarantee you won’t starve in this town. Wander around the Imperial Enclosure and marvel at the glorious ruins! Visit the Thien Mu Pagoda on the hilltop overlooking the Perfume River and immerse yourself in local culture. Walk besides the Royal Tombs littered along the riverside! Enjoy a bowl of bun bo hue, sweet and sour soup with rice noodles, beef and lemongrass. Hue is a fascinating place to visit, particularly for history lovers. A sprawling complex of ruined palaces, temples and walls, you will not be bored in the majesty of this place. Check out our collection of the best places to stay in Hue to find out why! 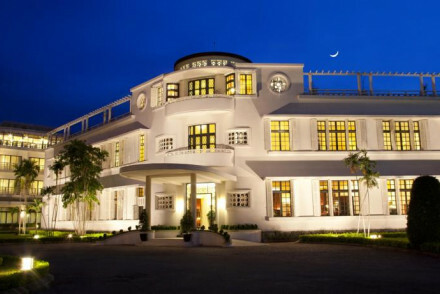 La Residence is a classic colonial villa spread over two hectares on the banks of the Perfume River and overlooking the former Imperial Citadel. Banyan Tree Lang Co looks almost like an ancient temple. 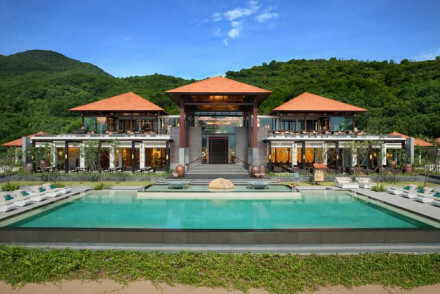 A stunning eco-resort with an award-winning spa, private pools and sumptous Vietnamese cuisine, this will leave you enchanted. Pure luxury. Pilgrimage Village, though not centrally located, is set in a stunning countryside village surrounded by manicured gardens and lush greenery and offers a shuttle service to and from town. The best time to go is between January and April, when there is little rain, and the temperature ranges between 17 and 31 degrees. Fly to Ho Chi Minh Airport, get a connection to Hue. Traditional Vietnamese architecture and decor with modern twists and amenities. Exposed brick and wood give it an eco feel. Rooms made for lounging in and extensive spa treatments ensure a relaxing stay. Foodies can get a taste of rural Vietnam by trying their hand at a cooking class. Cooking classes - Master the art of VIetnamese cooking. Sights nearby - There is a daily shuttle to Hue town. Hue's most luxurious hotel. A large Indochine era property on the banks of Perfume River. The rooms are simple yet elegantly designed and the suites large and airy. The restaurant's food is noteworthy and the pool exceptionally large. The perfect base for exploring Hue's ancient sites in style. 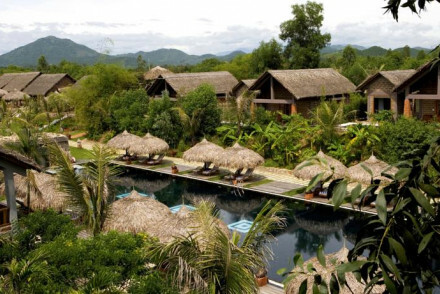 A stunning eco resort situated on a gorgeous white sand beach. Individual villas with traditional design feature private pools and dining areas. An award winning spa will soothe away any aches and pains. A host of activities keep all entertained. Excellent Vietnamese cuisine. Completely spoiling. Local exploring - With resident guides specializing in local heritage you'll be in the best hands to explore this fascinating part of Vietnam. Beach Life - The hotel boasts a beautiful white sand crescent beach with a number of water activities on offer. Sights nearby - Visit the UNESCO Heritage sights of the imperial city of Hue, the old town of Hoi An and the historical ruins of My Son. Cooking classes - Join a cooking class and learn how to make the famous regional dish Bun Bo Hue among others.